This week Friday cooking, I was assigned to work on appetizer. As you can see, there is not much appetizer on my blog and especially, it is the most important part of an entertainment party. Probably, I will organize an appetizer party. 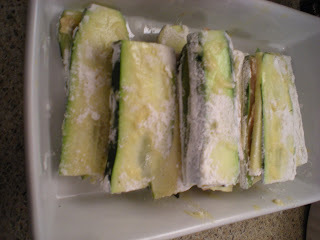 The zucchini sandwiches recipe is inspired by Michael Chiarello. I made some changes to the recipe because I found that it might be salty. For a vegetarian version, omit the prosciutto. 1. 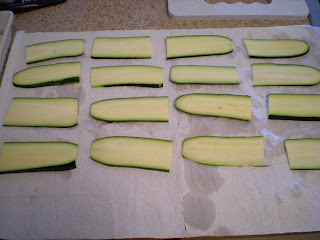 Cut each zucchini in half, then slice lengthwise about 1/4 inch. Lay them in pairs on paper towel. 2. Stack half of the zucchinis with prosciutto, 1-2 basil leaves and Gruyère cheese. 3. 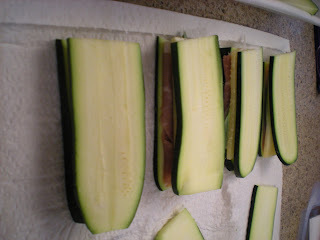 Lay the remaining zucchini slices on top of each stack. Cover with another paper towel and press down firmly in order to extract moisture. 4. Beat eggs in one bowl and pour flour into another bowl. Dip each stack in egg first then dredge it in the flour, shake off the excess. 5. In a large skillet, heat oil over medium-high heat. 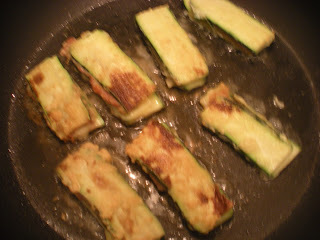 Cook zucchini until golden brown, about 2 mins on each side. 6. Remove and use a paper towel to drain oil. Top stacks with grated parmsean cheese. These look amazing. I love all the flavours. These look great and are quick to fix too. 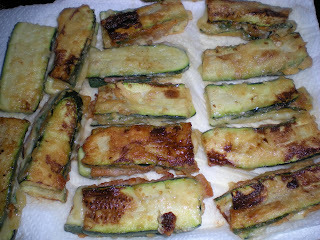 Cheese and zucchini...yummy! 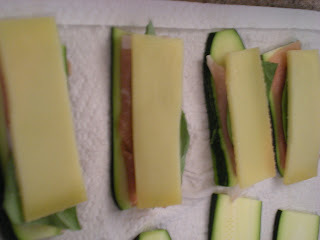 I have made the similar zucchini sandwiches, only with ground meat, with prosciutto would be even better!